The Renaissance Château de Villandry is mostly visited for its magnificent ornamental gardens – famously using vegetables for colorful formal displays. 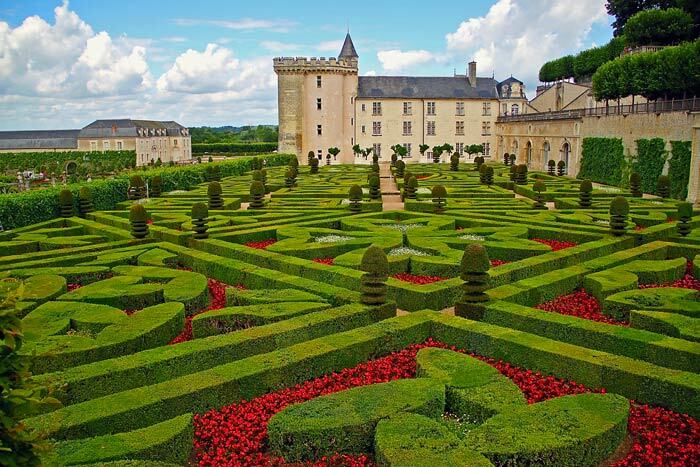 Renaissance Château de Villandry near Tours in the Loire Valley is famous for its exceptional formal gardens. The ornamental kitchen garden of Villandry, where vegetables are planted to form a magnificently colorful ornamental garden, is the highlight of this “jardin remarquable”. Villandry is a horticulturist’s delight with six separate gardens – all done to an exceptionally high standard. Visitors can enjoy peaceful strolls in the gardens and appreciate the magnificent views from the upper terraces and belvederes. The chateau is also open to the public. 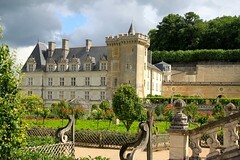 Château de Villandry is best reached by car or on a guided day-trip excursion tour. Château de Villandry, mostly built during the 1530s, was the last of the large Renaissance chateaux in the Loire Valley to be constructed in the sixteenth century. This gave the owner, Jean Le Breton – minister of finance for Francois I – the advantage of experience, as he also oversaw the construction of other palaces including Royal Château de Chambord. Château de Villandry is architecturally a masterpiece and was restored externally to it original Renaissance appearance in the early 20th century. Although still belonging to the Renaissance, Château de Villandry has none of the medieval influences still visible in most Loire chateaux such as ornamental machicolations, towers and turrets. It is much more a harbinger of a newer classical French style as seen in especially Henry IV’s Château de Fontainebleau. The Renaissance chateau replaced a 12th-century fortress – of this castle only the square keep was kept. This was done to a large extend to keep the memory alive that English King Henry II Plantagenet had met French King Philip II Augustus here in 1189 to admit defeat in what is known as the Peace of Colombier, as Villandry was known back then. The interior of the chateau is a more classical style introduced during the 18th century, which made the castle a much more pleasant place to live in. 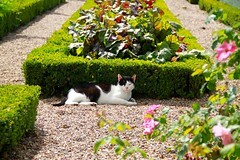 The chateau is furnished to a high standard but the main reason to visit Villandry is the gardens. 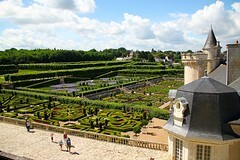 Travelers visiting other chateaux in the Loire Valley can confidently skipped this one and concentrate on the gardens. The gardens of Château de Villandry are magnificent and are officially a “Jardin Remarquable” according to the Committee for Parks and Gardens in France ( CPJF). These formal ornamental gardens are the main reason to visit Château de Villandry and a delight in all seasons. Joachim Carvallo, a Spanish doctor, bought Château de Villandry in 1906. He restored the exterior of the chateau to its Renaissance original condition but he is mostly remembered for his decision to reconstruct the gardens. 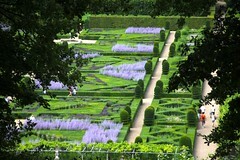 Much of the present gardens at Château de Villandry were created between 1908 and 1918. The new gardens follow Renaissance traditions and examples but are a truly new creation and not a simple restoration of Villandry’s original gardens. On the lower level are the amazing vegetable or kitchen gardens. 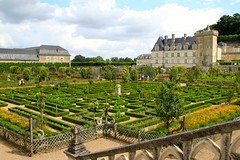 On the middle level directly in front of the chateau are the formal ornamental gardens. On the top level are the water gardens and the new garden of the sun. Each year, around 115,000 flowers and vegetables are planted in these gardens. 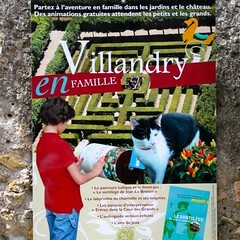 Visitors to Château de Villandry receive a free brochure with map (available in many languages) with a suggested walking route of the gardens. It is worth following the route to see the best of the gardens but backtracking and detours add even more pleasure. Even visitors with no horticultural knowledge who are simply enjoying the beauty of the plants can easily spend two hours in the garden. Garden lovers may well spend much longer. A good way to start a tour of the gardens of Villandry is to enter the chateau building through the left wing (admission to the palace itself is on the right). Go up a few flights of stairs to emerge at the terraces and belvedere with the most magnificent views of the gardens. Almost all of the gardens can be seen from here – only visitors to the chateau itself can get an even better view from the top of the keep. The First Salon is directly in front of the chateau. The area closest to the castle is the garden of love. The Love Gardens are divided into four sections: tender love (hearts separated by flames of love), passionate love (hearts broken out of passion), flighty love (fans symbolizing fickleness of sentiments, horns showing betrayal, love letters), and tragic love (bloodied sword blades from duels). Behind the garden of love is another formal garden with the crosses of Malta, Languedoc, and Basque as well as fleurs de lys. The Second Salon juts out into the rest of the park above the vegetable gardens. Here the flower boxes form musical instruments and music related objects. The suggested walk from here goes up the hill through a forested area. Although a fine short hike, the views are not much better than from the terraces, so do skip if the path looks slippery. The water garden is on the highest level. Here a Louis XV-style mirror pool supply water to the rest of the park. An ingenious watering system is employed to reduce the amount of water used to the minimum. The water garden is encircled by alleys of lime trees that reminds of walking in a medieval monastery cloister. Over a thousand lime trees are used in the 5-ha garden of Villandry. 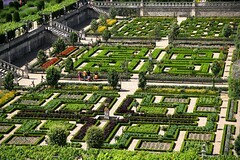 The garden of the sun is the newest of the gardens – it opened in 2008 to celebrate the centenary of the decision by Carvallo to recreate the marvelous formal gardens at Villandry. From the water gardens, visitors enter the Cloud Chamber with mainly white and blue-hued flowers and shrubs. Behind the clouds is the Sun Chamber – paths radiate like sun rays from the central fountain while the main color of flowers here are warm yellows and orange. The Children’s Chamber is a play area with picnic space. From the upper level, visitors pass by the labyrinth and the herb garden on the way to the lower level with the famous vegetable kitchen gardens. The herb garden, so typical of medieval monasteries, was added in the 1970s. Blind visitors may sample the around 30 varieties of herbs planted here. 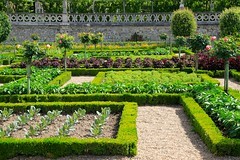 It is, however, the vegetable kitchen gardens that attract most visitors to Villandry. The garden here is divided into nine large squares of equal size but different geometric designs that are changed frequently to preserve the soil quality and to suit the different designs and colors employed with each planting. The ornamental kitchen garden uses 40 species of vegetable from 8 different plant families to create magnificent colorful patterns. The rose plants follow the medieval tradition of symbolizing monks digging in the garden. The ornamental kitchen gardens at Villandry are planted twice a year to ensure a colorful display year round. The two main growing seasons are spring (March to June) and summer (June to November). The colorful vegetables are planted for aesthetic reasons and thus rarely are harvested for consumption. 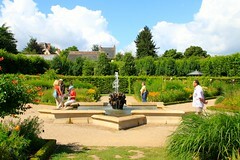 From the kitchen gardens, it is a simple flat walk across the moat back to the chateau entrance. Alternatively backtrack and detour other parts of the garden and take another look from the terraces and belvedere. The gardens of Château de Villandry are open year round from 9 am. Closing times vary with the season and light conditions but are at a minimum 5 pm (up to 7:30 pm mid-summer). The chateau building itself is open from mid-February to mid-November. The building is closed in winter, except during the Christmas and New Year’s school holidays, but the garden remains open year round. Opening times for the chateau are similar to the gardens but generally close at least half an hour earlier. 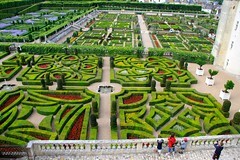 The ticket prices at Château de Villandry confirm that the gardens are the main attraction. 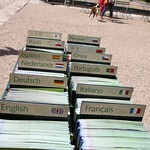 Admission to the gardens only are €6.50 (€4.50 for children 8 to 18 and students). If the chateau is added, the price is €10 (€6.50) but the palace plays second fiddle to the plants and many visitors prefer to enjoy the gardens and rather see other chateaux in the region. Disabled access: Only the ground floor of the chateau is accessible to wheelchair users but most of the gardens can be seen. However, fairly steep inclines make a strong companion advisable. 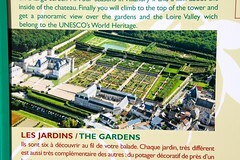 Wheelchair users may enter the chateau for free and receive €2 discount on the garden ticket. Special facilities and conditions also apply to blind and deaf visitors to Villandry. The only toilet facilities at Villandry are right at the entrance. Getting to Château de Villandry is easiest by car. Public transportation is extremely limited. Château de Villandry is only around 15 km to the southwest of Tours near the confluence of the Cher with the Loire River. 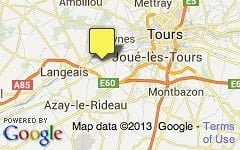 Nearby Autoroutes allow for fast driving times from many cities and nearby chateaux. 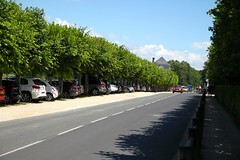 Free parking is available under the tree-lined street in front of Château de Villandry or at dedicated parking area nearby. Cycling in the Loire Valley is usually pleasant and a very good option in this area where the chateaux of Villandry, Langeais, and Azay le Rideau are only around 10 km away and Tours not much further. Villandry can be reached by Fil Bleu bus 117 from Tours station but only on Wednesday and Saturday from May to September. In July and August the bus is usually daily. Traveling time is around 30 minutes. Villandry is also often included in chateau excursion day-trip bus tours – usually in combination with Azay le Rideau and Langeais. Get Your Guide can give an indication of prices – double-check what is included if a tour is much cheaper than similar ones.